A timesheet keeps track of how many hours an employee worked during a specific period of time. 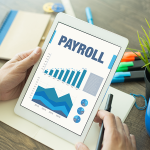 Timesheets can be used not only for small business employees but also for independent contractors and freelancers who bill by the amount of time they work. 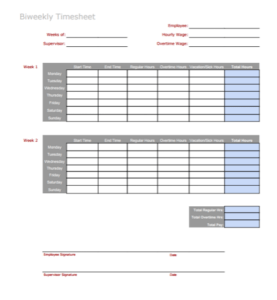 In this guide, you’ll find free downloadable timesheet templates for weekly, biweekly, monthly, daily, and semi-monthly pay schedules. 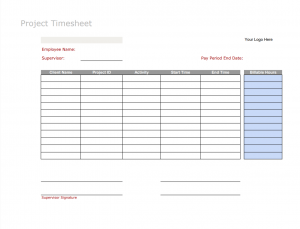 We also included a project timesheet for freelancers or staff that submit billable hours. If manually filling out and tallying timesheets every week is stealing valuable time from growing your business, try a digital time tracking system like Zoho People. You can easily track hours worked, schedule and approve time off, and communicate digitally with your employees. Start a 15-day free trial. Use this weekly timesheet if you calculate employee time worked, PTO and wages on a weekly basis. If you want to add things up manually, download and print our PDF. Otherwise, download the Excel spreadsheet or Google sheet, and it will handle the calculations for you based on formulas included within the spreadsheet cells. 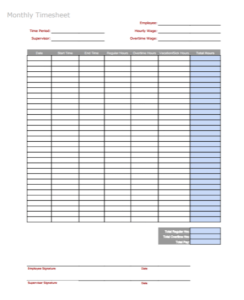 In addition, spreadsheet versions of these timesheet templates are customizable so you can add information to the timesheet such as employee location, employee number, or job title. Use this timesheet if you pay or calculate wages every two weeks. Open the Excel or Google spreadsheet if you want it to handle the calculations for you. Otherwise, download the PDF for your employees to complete manually. Of course, this means you’ll have to calculate their hours manually. 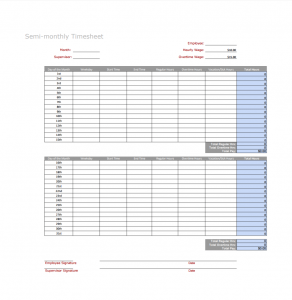 Use this timesheet if you pay or calculate wages on a monthly basis. Like the other templates, this one is customizable if you download the spreadsheet version. In some situations, like when employees are working an event or spending all day at an offsite training session, you’ll have a daily timesheet, and may need all employees to sign in and out on the daily timesheet so that you can track hours worked by all workers at the event. This can also be used by non-profits who don’t need to pay employees, but do need to track volunteer hours worked each day. If your company pays twice a month, as opposed to every two weeks, then your timesheet will need to have fields to track time for days 1-15 and days 16-31. You can manually input the day and date into the spreadsheet, or simply list the month. If you use this timesheet in a spreadsheet format, a good practice is to create a new tab for each month of the year. Employees would then input time-worked data in the correct tab (Jan, Feb, March, etc. ), so you’ll have a running total of all hours worked for the year. This template can be used by freelancers who need to calculate hours worked on projects. It can also be used in offices where workers’ time is tracked against customers or projects, or when staff need to designate billable hours so that customers can be invoiced property. If you want to stop asking employees to fill out paper timesheets, try switching to a digital system. Zoho People lets you create timesheets, record clock-in/clock-out times, and calculate billable time without any manual calculations. You can also handle PTO requests and approvals without having to sort through emails or hand-written notes. For less than $2/month per employee, the amount of time Zoho People can save you is well worth the price. Start a 15-day free trial to see if Zoho People is right for your business. 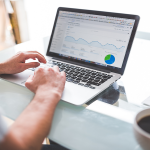 Tracking employee time worked is important to the bottom line of every small business. 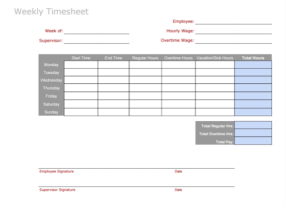 If you prefer to use paper timesheets, choose the template above that works best for your business. 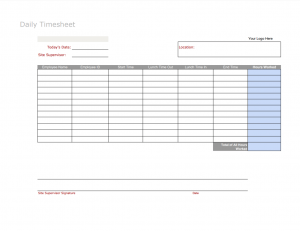 You can print the timesheet template as a PDF for your employees to complete manually, or download and customize the templates as an MS Excel file or a Google sheet so employees can input their time on the computer, and either print or email their timesheet to you when done. I am very glad to read about these application. Please keep posting more about these topics. Toggl is great, but costs too much. There’s a free Toggl alternative called Clockify. It’s a free time trackers that works exactly like Toggl and lets you have unlimited users. If you’d like Fit Small Business reviewers to review your product in depth, please send an email to info@fitsmallbusiness.com. I’m disabled and have just started to employ my own carers, which means I have to create time sheets and rota’s. My slight problem is that there are 2 shifts day and night with different pay rates. How can I design a time sheet to include the 2 shift types and different pay rates? I had a look at your weekly time sheet and there really good and simple just what I need, but there set up for a single shift type and pay. How can I adapt them to include what I need for 2 different shifts and two different pay? Is it possible to just use 2 different sheets — one for each type of shift/payrate? You can also download our templates as XLSX spreadsheet files, to customize them further in Microsoft Excel. As I worked my way down the Google search results, I clicked on your site. Of the half dozen spreadsheets I review, yours is the best by far for calculating pay. It makes it really easy for me to determine the amount to invoice to the client. Thank you! Thanks for compliment, Salena! We’re happy to help. I like the templates, but do you have one that provides spaces for lunch break times? Unfortunately I do not. You could make note of lunch breaks under “vacation/sick hours.” Or, if you open the document in Google Sheets or Microsoft Excel, you can rename the column “lunches/breaks/vacation” or even add a new column for breaks next to it. Weekly, biweekly, monthly, daily, and semi-monthly pay schedules.